Canberra’s Battery Test Centre has been going a couple of years now. What do the results so far tell us about the state of the home battery market? The full name of the facility is the Lithium Ion Battery Test Centre. But since that’s a bit of a mouthful and because they test a few batteries that aren’t lithium, I will just refer to them as the Battery Test Centre. They independently test batteries with the aim of providing the public with information and since they’ve stated that’s their goal I will be lifting images and graphs from their reports without remorse. So far they have attempted to test a total of 18 different batteries. At the moment only 16 can be tested, which is not a good sign. They installed the first 8 in the middle of 2016 and they acquired another 10 one year later. They publish a report on their results roughly every 6 months. Difficulty physically installing and connecting batteries. Problems with communication between batteries and inverters. Parts vital for installation that are not “off the shelf” haven’t been supplied with batteries. Instructions for installation were often not included with batteries or were inadequate. The majority were not delivered on time. Testing has shown some batteries losing capacity or “fading” rapidly. This may result in many future warranty claims for currently installed battery systems. One area identified as being desperately required is standardised protocols for communication between batteries and inverters. This would reduce installation times, decrease the number of faults, and should increase the number of compatible inverters per battery pack. The Battery Test Centre is run by ITP Renewables, a company that consults on and manages renewable energy projects. It is funded by taxpayers through a grant from ARENA. ARENA is what you get if you cheat when making an acronym. It stand for Australian Renewable ENergy Agency. Somehow the N in energy managed to be included in defiance of all that is good and holy when it comes to acronym construction. They didn’t even try to justify it by calling themselves the Australian Renewable Energy Ninja Agency. AREnA’s goal is to increase both the supply and competitiveness of renewable energy in Australia. Home batteries currently increase emissions but have the ability to support renewable generation, so AREnA funds testing. Besides assessing potential benefit, the testing also provides useful consumer information. Low cost access to accurate information is vital for the efficient functioning of markets – a fact many companies and politicians are either unaware of or selectively forget when it suits them. It is gobsmacking to see something so wrong written on an Australian battery test site. Haven’t people in Canberra heard of South Australia yet? I’m sure they have because I can remember Federal politicians complaining about us. One-third of the electricity consumed in South Australia was generated from rooftop solar and wind turbines before the Tesla Big Battery was built and the Big Battery is an extremely tiny battery compared to the state’s average daily electricity use. Since one-third is a significant contribution2 to anyone who isn’t my second wife3 the Battery Test Center clearly don’t know what they are talking about. It is the cost of intermittent renewable generation that determines how much is used and fortunately is now relatively cheap. Energy storage can definitely help but it is 100% not necessary. Ampetus has recently gone bust, though it is possible another supplier will start importing the same Sinlion batteries from China. Aquion has gone bankrupt. While they were bought up by another company, the Battery Test Centre says warranties for their batteries are not being supported. The Samsung SDI is now the Hansol AIO. The Kokam StoreaXe no longer appears to be available. The Powerwall 2 is currently not available and Tesla says it won’t be until “early next year”4. 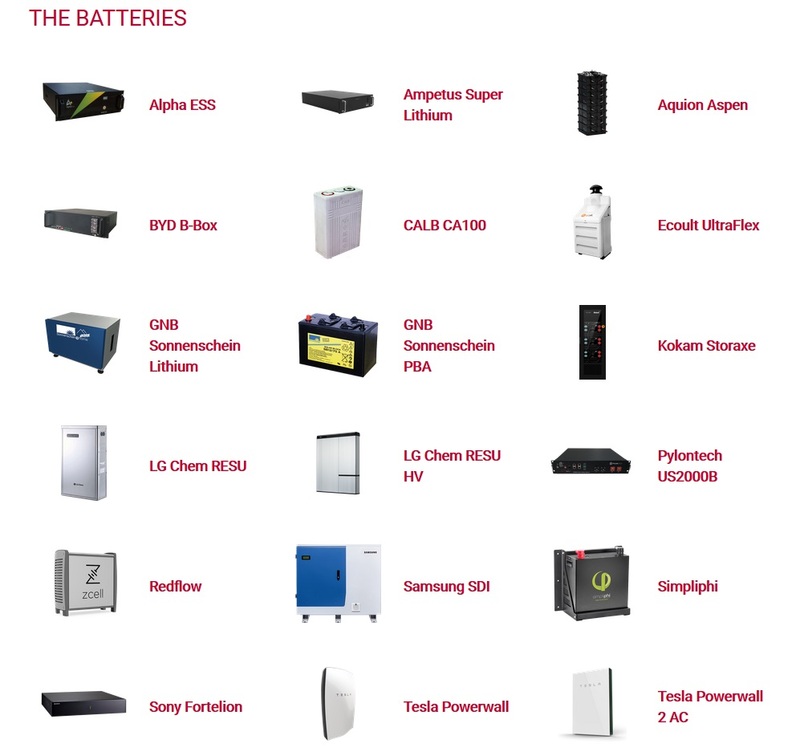 If you want to know what battery systems are available, we regularly update our Battery Comparison Table that lists all the home battery systems currently available for purchase in Australia we are aware of. If it’s not on the table then there’s probably no Australian supplier. But if a battery is available and it’s not on our table, let us know. If we can get information on it, we’ll add it. 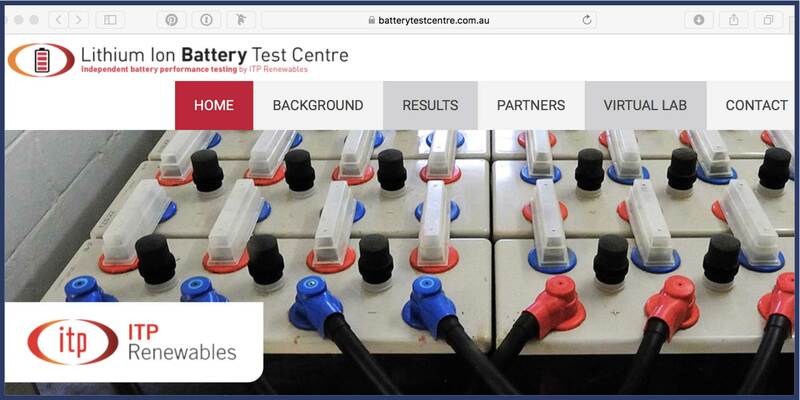 To keep the test fair and avoid manufacturers sending their best batteries or even one that contains higher quality components than what the average punter gets, the Battery Test Centre attempts to buy their batteries retail as though they were a normal Australian household5. But at times they have had no choice other than to buy directly from the manufacturer. The battery testing center has a climate-controlled room where the lithium batteries are cycled three times a day; with each charge and discharge cycle taking 6 hours. This is nominal cycling where they are fully discharged to the limit the manufacturer allows and not a full 100% discharge, which would be bad for all of their batteries except the Redflow ZCell. The idea is to simulate nine years of once a day cycling over a 3 year period. This won’t perfectly match real world conditions because time has a destructive quality all of its own and causes additional decay over that caused by use. But use is the main factor and so long as people remember that real life results are likely to be slightly worse, it is a reasonable compromise for getting information soon enough for it to be useful. While it would be possible to cycle the batteries at an even faster rate, this would make the test unrealistic as it would cause them to get hotter than they would in residential use. The two lead-acid batteries being tested are not cycled as often as lithium batteries due to their different characteristics. Looking at test results they appear to be cycled once per day. Most home batteries are installed outside. While they should definitely be placed under shade, they will still be exposed to outside air temperature — known as “ambient” temperature to people who like fancy words. The Battery Test Centre uses a climate controlled room to simulate outdoor temperatures they expect the typical battery system to be exposed to. Report 1: September 2016 — Installation of their eight Phase 1 batteries. Report 2: March 2017 — The results of up to nine months testing of their Phase 1 batteries. Report 3: November 2017 — Mostly covers the installation of their 10 Phase 2 batteries. Report 4: March 2018 — Test results of their functioning Phase 1 and Phase 2 batteries. Their Phase 2 batteries were installed less than a year ago and the problems they experienced should be more relevant to people getting batteries today. Unfortunately, there wasn’t a huge improvement from the Phase 1 installations. The batteries had been tested for a longer period by the time Report 4 was published. Some batteries are now unavailable — though this is also true for some Phase 2 batteries. All their reports can be downloaded here. 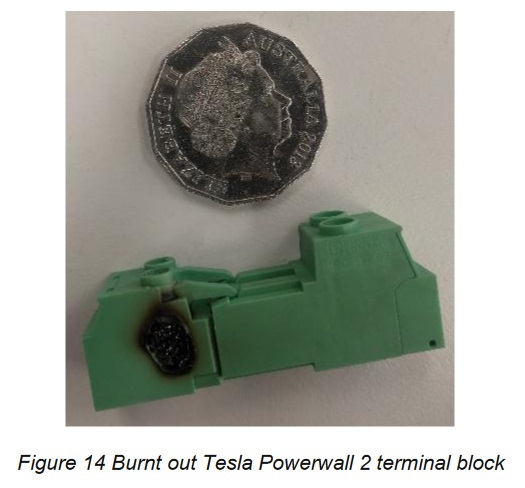 Three months after testing started the StoraXe battery pack failed and permanently damaged its battery cells thanks to a faulty built-in Battery Management System (BMS) that failed to prevent its charge falling too low. I don’t know of any other StoraXe system installed in Australia and, as far as I am aware, they are no longer available. The CALB battery pack had a defective cell that was detected soon after installation. The manufacturer replaced it in one week, which is reasonable as these things go, but while it continued to operate acceptably the battery pack developed problems that made it difficult to measure its output accurately and its test results weren’t used. The Battery Test Centre says they publish reports every six months, but this one came out eight months after their last one. In this report they cover the installation of their Phase 2 batteries, which consist of eight lithium batteries, a Redflow ZCell zinc bromide battery, and an Aquion saltwater battery bank. Unfortunately, buying home batteries can be a risky business. Two companies — Aquion and Ampetus — went bust in under a year. Due to bankruptcy, no support was given for the Aquion saltwater battery and its installation could not be completed. Also, the Tesla Powerwall 2 lacked functionality that would allow it to be charged and discharged as required for testing although it would have work if used for a home installation. Two out of 10 suppliers going bust within a year with one of their batteries being uninstallable from the get-o are not good odds for someone looking to buy an untried new battery. Buying from a large established company can protect against this but still won’t guarantee they’ll be around in 5 years time to honor their warranty. Only four out of the 10 Phase 2 installations went smoothly or at least as smoothly as could be expected. The six others had problems ranging from arriving late to its manufacturer going bust and the battery being unable to be installed. I have listed all Phase 2 batteries below, the inverters they were installed with, and problems had obtaining and installing them. It was originally planned to use this battery pack for Phase 1 testing, but the company cancelled the order and returned the money with the explanation it needed further development. While definitely annoying, this is more ethical than releasing a product that isn’t ready. Installed with an SMA Sunny Island inverter which is no longer available for grid connection here due to updated Australian standards. Purchased directly from the Chinese company EVE7 and communication was difficult. Arrived more than 2 months after ordered. Installation documentation provided with the batteries was not sufficient. Ampetus recently went bust and is no longer around to give support. The battery packs were produced by the Chinese company Sinlion and may become available through another supplier or suppliers. No documentation came with batteries but Ampetus was able to supply information. No cables used for battery communication with the inverter were supplied. Batteries had communication problems and Ampetus advised changing the cables used to fix it. Aquion has gone bankrupt. While it was bought out, the Battery Test Centre says they are not supporting previous warranties. I am not aware of any saltwater batteries being sold in Australia since they went bust. A Victron Multigrid inverter was unsuccessfully used. Arrived 2 weeks late and company went bust soon after. Cables to inverter were not supplied. No documentation came with batteries but was available online. Because of Aquion’s bankruptcy, no installation assistance was available and the installation was unable to be completed. I am certain the Battery Test Centre has a lot of technical expertise, so you can imagine how difficult it must be for an inexperienced installer to cope with a new battery system that’s a cow to install. The BYD B-Box is produced by BYD, which is a giant Chinese manufacturer of batteries and electric vehicles. The instruction manual was clear and comprehensive. These are produced by the German battery company BMZ GmbH which is based and manufactures in Bavaria. Batteries arrived in Australia 4 days late, but they are installed in a cabinet that arrived 3 weeks late. Extra breaker boxes were delivered which had to be returned. The batteries came with no documentation but it was provided by email and was clear and easy to understand. A program necessary to install the batteries had to be requested and was delivered on a USB thumb drive. When it comes to delivering home batteries, it appears not even Germans can be on time. LG Chem RESUs are produced by the giant South Korean Corporation LG. They are Australia’s most widely installed home battery. Used with SMA Sunny Boy Storage battery inverter. Higher voltage meant cables were thinner and so easier to install. It came with clear installation documentation. Pylontech is a Chinese producer of lithium iron phosphate batteries. They claim 5,000 homes around the world have installed their batteries. Used with SolaX X-Hybrid inverter. It was not made clear the interconnecting battery cables would need to be purchased separately. The Redflow ZCell is an Australian designed battery that uses a zinc bromide solution that makes it unique among home batteries. A Victron inverter was used. Purchased directly from Redflow rather than through a distributor and arrived before the given date. The original ZCell battery was replaced by Redflow due to contamination of the zinc bromide electrolyte solution and was later replaced with a third unit due to an electrolyte leak. Its 290kg of weight requires lifting equipment which complicates installation. Once in place, Redflow’s technician had no problem with installation. SimpliPhi batteries are produced in the US and in wide use by that country’s military8. A SolaX X-Hybrid inverter was used. Arrived from United States on time. Did not come with battery connection cables. Does not require inverter communication cables. Not providing cabling complicated installation, but apart from that was easy. The Battery Test Centre originally planned to use the DC version, but Tesla cancelled its production even though they had already taken deposits for it, so the AC version was used. The Powerwall 2 is AC coupled and so does not require a separate inverter to function as it has its own built in battery inverter. It was supposed to be available in January 2017 but did not arrive until May and this was one of the first units in the world to be delivered. That’s 4 months late. Tesla said they would provide a technician to assist with installation, but this did not happen. Installation was much quicker and easier than with the Powerwall 1, so this is a clear example of a company learning from experience. The Powerwall 2 also requires the installation of a Gateway box (a fact Tesla does not advertise) and its installation was also easy. Did not come with installation documentation and it had to be accessed online. After charging for the first time, no problems were experienced but a burned out terminal block was discovered and replaced. While the Powerwall 2 would work if installed in a home, it lacks the functionality to be charged and discharged as required for testing. This ability was expected to come with the Powerwall 2, but did not. The Battery Test Centre hopes to be able to get it running for their next report that will be released in a few months time. Goods don’t always arrive on the delivery date a company gives. It’s a fact of life. But half the Phase 2 battery systems were late and that is pretty shoddy. While some manufacturers have have got their acts together and delivered on time, Tesla was not one of these and has earned a reputation for tardiness. 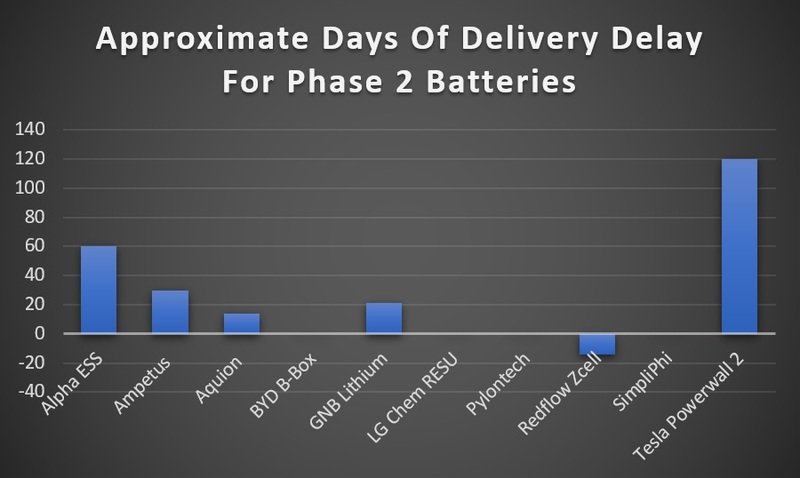 On average the Phase 2 batteries arrived one month late or 2 weeks late if you ignore Tesla. Only BYD, LG Chem, Pylontech, and SimpliPhi arrived on time while Redflow was able to install earlier than the given date. 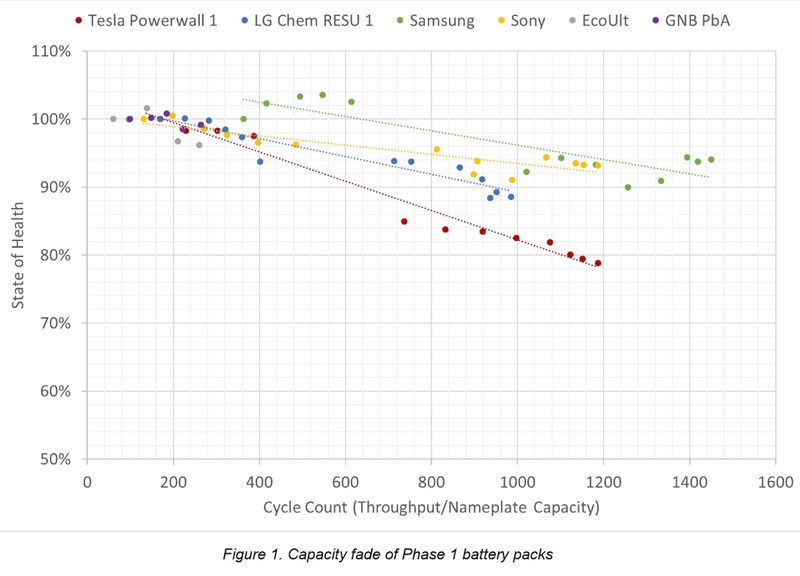 This report has the latest test results on battery capacity deterioration. It also reviewed problems suffered by test battery packs. The CALB battery pack is operating acceptably, but has developed some problems that make its test results unreliable and so isn’t included in test results. Three of the eight Ecoult Ultraflex lead-acid batteries were under-performing and Ecoult replaced all eight under warranty. The GNB lead-acid battery has degraded, apparently due to sulfation, which is a common problem for lead-acid batteries. Attempts to reduce the problem were unsuccessful. The Ampetus Super Lithium battery was returned to Ampetus in Queensland due to communication problems between the battery and the inverter. It was given a firmware update and returned. Redflow replaced their ZCell soon after installation due to electrolyte contamination during manufacturing. Early this year the replacement developed an electrolyte leak. Redflow determined it was due to damage during transport and replaced the unit under warranty. Tesla still have not provided the support that would enable the Powerwall 2 to be tested, but the Battery Test Centre hopes to have it operating soon. All 14 of the lithium batteries tested would have functioned if used for home installations. Two of them required servicing and fortunately one was serviced before its importer went bankrupt. Of the two lead-acid battery packs, one was replaced under warranty while the other has suffered capacity degradation. While lead-acid batteries have their fans, this is not a good result for them. Currently lithium batteries are the only major contenders for on-grid home energy storage. This fast fall in capacity was probably due to the realistic temperatures they were exposed to. The original Tesla Powerwall suffered the worst but its testing conditions were not the same as the others because the SolarEdge inverter it was installed with charges and discharges the Powerwall over 4 hours rather than the 6 hours of the other lithium batteries and can’t be adjusted. 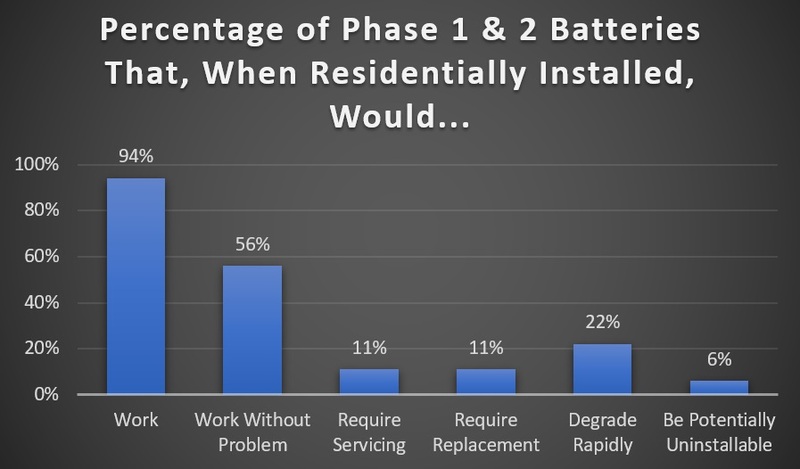 While battery warranties normally allow for a considerable amount of capacity fade, it looks like many currently installed home batteries will need to be replaced under warranty9. The best performer was the Samsung SDI (now available as the Hansol AIO), which suffered only a 4% decline in nominal capacity and 5% actual. The Pylontech had no deterioration while the LG Chem RESU HV had little to no deterioration, so they are the clear winners. The surprise loser is the SimpliPhi, which is rapidly losing capacity despite having a warranty for 10 years or 10,000 cycles. The GNB suffered almost identical deterioration. Since there have only been a limited number of test cycles for Phase 2 batteries it’s not possible to draw firm conclusions about capacity fade, but it’s still not looking good for SimpliPhi or GNB. UPDATE 8TH AUGUST 2018: I have some excellent news. The Battery Test Centre says they screwed up the testing of the SimpliPhi battery, so there is no reason to believe it will deteriorate as these results suggest. I have not yet received information on if they also made a mistake with the GNB or other batteries. Lithium battery packs were the LG Chem RESU1, Sony, SimpliPhi, Pylontech, and Alpha. 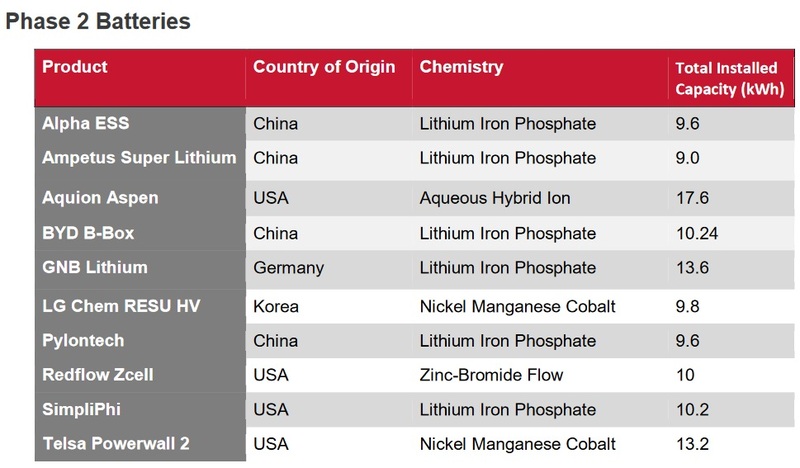 I would expect new lithium batteries to have an efficiency of over 92% when used for home storage, although the figure will depend on the exact type of lithium battery chemistry used. The Alpha ESS did surprisingly poorly for a lithium battery. UPDATE 8TH AUGUST 2018: The Battery Test Centre has said they didn’t test the SimpliPhi battery correctly. I assume this would have affected its measured efficiency. The EcoUlt and GNB PbA are both lead-acid batteries and did very well for that type. The Redflow has the lowest efficiency due to its zinc bromide chemistry. Only 10 out of 18 batteries bought for testing have worked without problem. But of those, four are suffering from what I would call rapid deterioration in capacity. So if you picked one at random your chances of getting a battery that would function without problem and looks likely to continue to do so would be one in three. Those are lousy odds. You can improve your chances by going with a large proven manufacturer such as LG Chem, but even they have had problems with batteries arriving on site with too little charge to be installed. Fortunately, they appear to have eliminated this problem, but it goes to show that even if the customer does everything they can to ensure a smooth installation there is no guarantee that will happen. The “Work Without Problem” category is over 50% because I didn’t include battery deterioration as all the working batteries are within their warranty limits for now, although it doesn’t look like they’ll all remain that way. Also, while the Tesla Powerwall 2 may well have worked without problem if it had been residentially installed, because it couldn’t be tested I haven’t included it in that category as it may have developed problems. These figures are pretty awful. I am thinking about buying one of those fancy TVs with more pixels than you can poke 8,294,399 sticks at10. Even if I can get the cheapest one, I am 98% certain it will work when I get it home and plug it in and about 95% certain after that it will last till the end of its warranty period. While I don’t expect new battery systems to have that level of reliability, it is clear that many manufacturers are saddling customers with inadequately tested batteries and making them pay for the privilege of being beta testers. Provide all components necessary for the product to function. Provide clear installation instructions on paper with the product and not just online. Provide videos on how to install the product online. Be available to provide technical support. Battery Management Systems need to be fully compatible with their batteries and reliable to ensure batteries aren’t damaged, as occurred with the StoreaXe battery. Inverters need to be exhaustively tested by battery manufacturers to ensure that inverters claimed to be compatible are actually fully compatible. Suppliers need to be prepared to help troubleshoot any problems that may arise. Communication protocols between batteries and inverters need to be standardised. This is probably the Battery Test Centre’s biggest gripe. Lower costs, as companies will be spared the expense of developing their own. Fewer faults, as communication should be less buggy and more functional. An increased number of compatible inverters for battery packs. Going by their past publication history, the Battery Test Centre’s next report should be out in 1 to 5 months. I will definitely write about it when it’s available and I look forward to seeing how their Phase 2 batteries perform after 3 years of simulated use. It should be a useful indicator of what are the better battery systems to buy. Also there’s the drama of seeing if all the currently functional battery systems will still be up and running. It’s even possible they will have the Tesla Powerwall 2 ready for testing and we’ll see some test results for it — but that’s mostly for the benefit of my personal curiosity, as they seem very hard to get at the moment. Great post. Never be an early adopter unless you have money to burn! In another 3 or 4 years the shale out will be largely complete. Even now it seems the Koreans emerging among the clear leaders. Very illuminating Ronald! Never realized it was so unsatisfactory in so many ways. But then batteries are usually the least reliable part of any system. What’s the most common way for a car to let you down? A phone? A toy? and said that any less is grounds for a warranty claim. As they claim 80% when new, it’s not comforting to think what the efficiency might be after 10 years if it’s only 65% when new. After the big cheap “supercapacitors” turning out not to have arrived 20 years early after all, either better efficiency or a _much_ better price for the Z-Cell is needed for a viable highly durable battery to exist, I think. I’m waiting for the builder to come back with a quote for my tree-change now. May have to put in lead-acid batteries for now, and wait a few years for alternative technology to mature before throwing money at one. Will have to look at the price of the Pylontech LiFePO4 batteries, though, once the test has run long enough for a dip to show. What great timing, last week I received word that the Redflow battery is getting more difficult to purchase due to CEO direction focus on Telcom installations. Some what disappointed (Redflow Share Holder) as having purchased and design 90% of my system ($27K and growing) with a space for a Redflow. With this report I am now energized to look at alternatives like Pylontech and BYD to complement an existing LG Chem 48V (Easy Pesy to get). Cheers to you Ronald, PECS Solar Power Pty Ltd. Thanks for the order – and sorry for the confusion. The book was officially released today – and all the pre-orders were shipped today (including yours). So expect it early next week. A well compiled article Ron – thank you. The battery storage manufacturing industry is in a state of flux as must be expected – t’s a new industry and spinning off from the well-financed EV R&D industry, but unfortunately clinging tenaciously to the perceived must hang onto ‘old chestnuts’ from the 1960’s old school UPS/Telecoms/DIY Off Grid industries. And in essence this has created a confused technology brought to market – which is problematic at best and catastrophic at worse. RE Solutions Storage has not been a technology conceived from current world’s best practice electrical engineering principles and then worked up globally on a blank canvas, as a fit specifically for purpose design. It has been little more than a bastardisation from the very old 24 – 48 V UPS and Telecoms designs, suitable for DIY installations safely (< 50 V). Well the outcomes globally have not been encouraging as we are all now seeing. One thing is absolutely sure though, and that is standardised in any form, or calling for generic communications standards for batteries and connected PCE, is definitely not going to happen and nor should it. The way forward for the RE storage industry is not standardisation; just the opposite in fact is the best route. There are companies that have taken the bull by the horns and have integrated total solutions that mimic the pathways that the EV industry has evolved by. This focus shift to integrated total solutions demands engineers to adopt world best practice electrical concepts and the commercial point of difference between competitors in this space, is then more focussed on management and control systems logic, overall functionality, and 'superior smarts'. Inferior functionality then never gets any traction at all. Instead of integrators evaluating this item and that item and how to hobble them together etc etc, this issue becomes a redundant and irrelevant exercise moving forward. Only the proven and best performance and hands off functionality solutions are then worthy of genuine interest by systems integrators. “to honor their warranty” ? You’re not really a refugee who has escaped from trumpland, are you? Regarding the tesla imaginary batteries, it will be interesting to find whether they will be manufactured, given that tesla is reported to be downsizing. Maybe, they are going to stop producing batteries, and put duracell batteries in their cars. Flemish. I come from a long line of Flemish merchants. They were very smart and cunning people which you have to be to make a living from selling flem. comments include energized, realized…that trump has a lot to answer for. Get more panels, forget storage cells. I have a significant radio (AM) interference from my solar pv system during daylight hours, the installer has had few attempts to fix.The system was installed 6 months ago, it is a SolaX X hhybrid inverter and Pyllontech battery. Can it be fixed, how? Electronic devices have to meet Australian standards for radio interference so there should be either no or minimal radio interference from an inverter. If a product doesn’t meet Australian standards then you should be entitled to either a repair, replacement, or refund under Australian consumer law. The easiest way to check if it is the inverter that is causing the interference would be to turn it off and see if that stops the problem. As for how to fix an inverter that is emitting radio interference it shouldn’t be, I’m afraid I don’t know. I suppose you could use wire mesh or a metal cabinet to block the inverter’s interference, although it would be necessary to ensure there is adequate ventilation for cooling. I suppose you could do something similar for the radio and put it in a biscuit tin so there’s metal between the radio and the inverter, but that’s only likely to work if the inverter and the station you want to listen to aren’t in the same direction. Ken, since you have batteries, we could risk assuming that the inverter sometimes runs outside daylight hours without causing interference to your AM reception, given your description. If that is so, and if it’s not the MPPT battery charger function of the inverter, then you could have something like the Maxim chips generating RF interference – although other reports seem to be more of TV interference. Trying to individually shield panel optimisers is unlikely to be successful, as the PV cabling will act as an antenna, radiating the interference. You can buy “ferrite bead” RF suppression cores to put on cables. The ones I have are two half-tubes of ferrite, held in a hinged plastic capsule, which is opened, then closed around the cable. The effect is to locally increase the inductance of the cable, and that attenuates high frequency differential signals. You can’t very well shield the AM receiver against radio frequencies, as that would also block radio reception. (The interference is in the part of the AM band you’re listening to, unless it is getting in to the receiver after the RF front end. Putting the radio in a metal box, with an antenna wire coming out, could test that. There is nothing you can practically do to the inverter to reduce the RFI component Ken, and relocating your radio is your only practical fix available. All inverters using IGBTs, present a high potential for generating RFI. Fast switching in these devices generates sharp-edged waveforms with high frequency components that generate more RFI. The most likely complaint is interference with AM band radios 500-1600 Khz. Good RFI control is a function of PCB design and the use of appropriate Chokes and Filters. What exactly do you find objectionable in this statement? At night, PV panels generate nothing – Do you agree? When the wind doesn’t blow (or blows too hard) Wind farms generate nothing – Do you agree? That’s what Snowy2 and SA’s Tesla battery are all about – acknowledging that power from intermittent generators has to be STORED (for those hours when the wind doesn’t blow and the sun doesn’t shine) – Do you agree? Brian you should remain mindful that On Grid battery banks are not designed with high reliability and full functionality in mind when used in Stand Alone solutions. Stand Alone systems have no “free partner” such as the grid supply to take over when things go pear shape as they will. You will find a lot of information on this specific subject if you put in the effort. The imperative for Stand Alone systems is “guaranteed supply 24/7” no if’s no but’s and that is the system designer/integrators challenge and responsibility. On grid systems have no such imperative to satisfy, and that point is a significant make or break one from a commercial perspective that very few On Grid practitioners consider or even care about much in practice. Remain circumspect and inquisitive about the specified (guaranteed) operability and reliability of Stand Alone system designs put before you is my advice Brian. And all the best for your project. I had heard not many batteries had been battle tested for stand alone . I am not sure if it was solar quotes blog or another Sparkie saying Sonnenschien (Exide) were battle tested . The last quote I got last night the fellow uses BYD Lithium. He will not touch AGM he says . He said Sonnen ( I assume Sonnenschien ) are Hybrid batteries. I would like to send you his email to get your opinion on the products but if not he suggested Risen panels , SMA inverter and SMA Sunny Boy some control box and BYD Lithium Batteries .I really appreciate your help as the quote was $35K . Of course I would be happy to help you with some constructive and useful advice as you think about how your requirements and expectations can be reliably met by moving Off Grid. Can you please contact me by email and we can discuss this more outside of the blog though. You can find my contact details on Google Brian. Brian experience tells us that technology advancement is incremental over time and batteries are no exception. So of course we will and can expect to see huge improvements in functionality, performance and reliability in battery storage going forward. Honest brokers like ITP in Canberra and Finn & Ron (Solar Quotes) represent a small group of professionally detached expert commentators that don’t pull any punches when discussing RE issues, and have no vested interest in RE products under examination. They are free to tell it like it is, and they do, which is what consumers want and need from RE industry practitioners in general. Ultimately though as engineers, technicians, and consumers alike we make up our own mind on all things and that is the way we all want it, and generally therefore we should assume responsibility for our own decisions, as long as we are fully and frankly informed by those on who we depend for accurate and honest advice. This is where independent commentators like ITP and Solar Quotes are very important. The ITP reports summary for battery testing from 2016 to 2018 is linked to below, but of course it comes like all reports with a rider that as a single report from one entity alone, rather than a peer reviewed article; its usefulness will ultimately be that accorded it by the reader. Brian your BYD battery in a well-integrated and controlled Stand Alone solution an excellent choice I am sure, and please keep us posted on how it turns out. Lawrence is BYD designed forStand Alone only not a generic battery ? We are contemplating solar and storage for our country WA property and would like to know a couple of things prior to accepting a quote. 1. What is meant by the term 5kw or 10kw for a solar system,is it the kw rating per hour or per day? 2. We have a 110metre run of 35mm2, 3 phase cable from the proposed system location to our residence and another 85 metre run of 25mm2, 3 phase cable to a 2.2kw submersible pump from the residence . Are these cables sufficient to provide minimum volt drop? 3. Where is the best location for a battery storage system, which we require for when the grid fails? 4. Are there good quality small wind turbines on the market to keep batteries topped up when solar has no light? 5. Do we require an electrical engineer/electrician to design this system for us because the salespeople who have contacted us are only that “salespeople”? 2. The good news is, while your cables are long, you should not have a problem with installing a 3 phase solar inverter of 10 kilowatts or less at your home. (It may be possible for you to go larger than that if you wish, but you’d have to discuss it with your installer.) But with that length of cable a single phase inverter won’t be practical. 3. The best place for a battery system is generally near the inverter. But note it can be much cheaper to use a generator to get through blackouts than batteries. You may want to hold off getting batteries for a few years and wait for them to fall in price. 4. I am afraid small wind turbines are not cost effective. If your goal is to keep batteries topped up it makes more economic sense to simply install more solar panels as they will still provide some power even on very overcast days. And answer the questions that come up as best you can. Jeff – a further clarification of the capacity of the solar system, is this. If you have a 5kW solar system, that means that, in ideal conditions (and, only in ideal conditions), it can be producing as much as 5kW at any time. It is like, if you have a tractor that can go 12 miles an hour (a Ferguson TEA 20, for example), it does not mean that it can do that speed while pulling a large trailer full of hay. We had two solar systems, with a total rated (by Western Power) capacity of 5kW. They involved one inverter of 3kW capacity, and one inverter of 1.5kW capacity. They involved 5kW of panels capacity. The important word, here, is capacity, as the maximum p0ossible output. One roof face faces aboutENE and the other faces about SW. At peak production, we would get about 80% of the capacity of the panels. From memory, we averaged about 5kWhr (what are called “units” of electricity, per day, per kWof panel capacity. 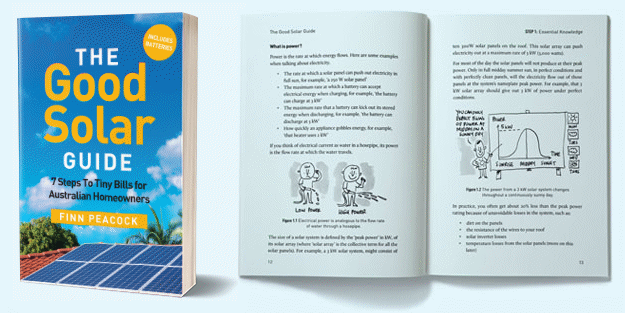 Many factors affect how much actual power, you will get produced with a solar system – the amount of shade, the number of fine days, compared to cloudy/overcast/rainy days, how many hours of sunlight you get, and, importantly, the orientations of the panels. Now, with me using the past tense, for the two systems, one of them failed, before four years was up. The company that had installed them, had gone broke and disapp0eared. The manufacturers of the inverters and the p0anels, have no presence in Australia. So, there is no warranty coverage (the system, failure, occurred while the components were still supposedly covered by warranty). So, you need to get reputable components, with worthwhile warranty coverage, from a reputabel, established, ad, reasonably stable installation company. And, be wary of the quotes. In trying to get quotes for a replacement system (to replace both systems with a single system), two separate companies gave quotes that included systems over 10kW in capacity, for single phase syastems, which., both companies knew to be illegasl (like seklling heroin)m and, tpo dangerously exceed the xcapacity (including overloading allowance) of the inverters. So, I woish you luck, but I think it is something that needs a great amount of research, before signing any contracts. Once you get a worthwhile system, it should be of great benefit. Our first system installed, the one that did not fail, paid for itself, within three and a half years. Brett you have made some important observations particularly for ordinary Australian consumers, who rightfully expect transparency and honesty from all involved in the Australian RE Industry, but that is not the case unfortunately. 1. “Worrisome Results From Canberra’s Battery Test Centre” by Ron Brackels (July 13th). 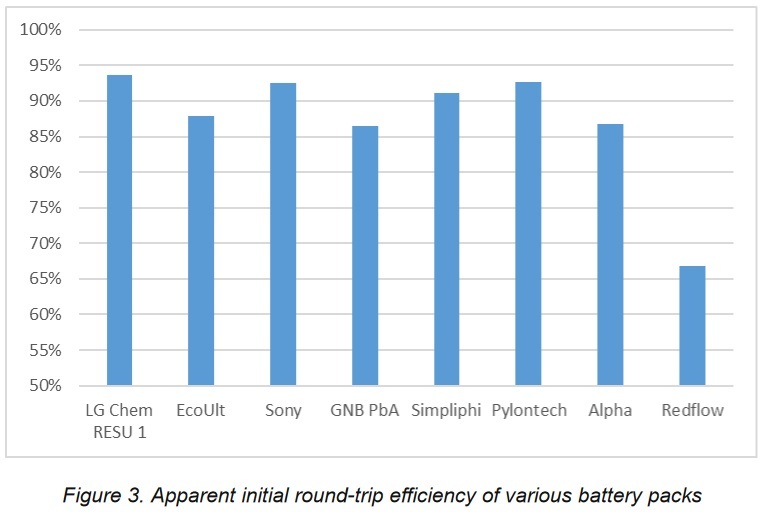 This excellent report by Ron tells us about the results of functionality and performance tests on ALL of the well promoted batteries in Australia starting in June 2016. ALL batteries failed to be fit for purpose. What is even more disturbing though is what wasn’t reported by Canberra testing company ITP in their public reports. I spent a couple of hours with the ITP Test Project Engineering Manager Philippe McCracken last week discussing these results, and the “inside story” through the collective observations, thoughts, and frustrations with the batteries over this two year project period is much more than “Worrisome” as Ron Brackels suggested. 2. If this wasn’t enough bad news, two days later: “Solar Batteries – Silver Bullets Or Expensive Toys? Video And Summary” by Michael Bloch (July 15th) reported on a forum in South Australia where a panel of Australian solar industry veterans and experts discussed the current state of play with regard to home battery storage in Australia. Their summary conclusions echoed the industry crippling ITP results and expressed an almost unanimous withdrawal of confidence in the Australian battery storage sector, and went as far as warning their own potential customers against supporting or purchasing battery storage technology at this point of time. Contrast this week’s depressing battery storage revelations, against the hysteria and hype over the last two years by the RE wholesaling/retailing industry in general and key Australian Solar Industry Organizations “talking up” the early take up of “game changing” battery storage technology. The near hysterical battery storage talk of June 2016 seems to have been dealt a fair dose of June 2018 commercial reality. And the RE industry must work harder across the board to claw back some consumer confidence. Lawrence – interesting. Can you give any insight as to why the PW2 could not be tested? After all they had one – it has a built in inverter in and out and therefore I remain unsure as to why it can’t be tested by simply charging and discharging it continuously? yes you’d have to fool it into thinking it had 240V present or use the Backup Gateway but that seems not beyond the scope of test laboratory. It also seems to me that Mr. McCracken has a few questions to answer as to why test results have been messed up? It would seem pretty basic methodology. Design a regime to charge the battery and discharge the battery with a load over a period designed not to exceed it’s designed charge and discharge characteristics. Datalog it all. Change the test environment temperature. Repeat and rinse. Worryingly if one result is problematic how can you have faith in the others?